Grainger Public Relations » A Degree of Flight: New Students Hope to Pass with Flying Colours! A Degree of Flight: New Students Hope to Pass with Flying Colours! Seven new aviation students have taken the first tentative steps on Dundee’s degree of flight! 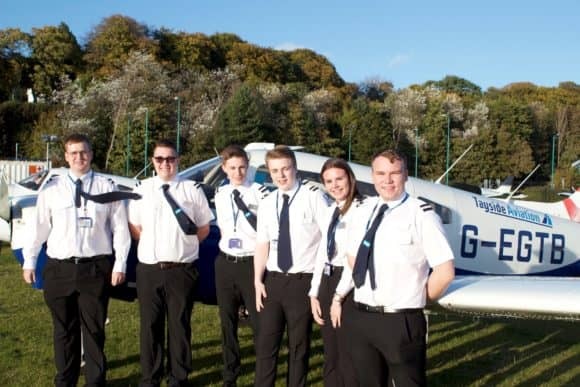 The group is the latest intake on the pilot degree which is run by Dundee-based flying school and aircraft engineering company Tayside Aviation in conjunction with Middlesex University and Aviation Skills Partnership. Six of the seven new students. The new students, who bring the total number of degree students to 39, are Zac Chiswell (18), from Carluke; Alistair Cunningham (19), from Stonehaven; Duncan Mills (20), from Peterborough; Kieran McGregor (19), from Stonehaven; Emily Horne (18), from Broughty Ferry; Shaun Sewell (19), from Newcastle, and Panchbhaya Rokayya (19), from Dundee. The next intake will arrive in April 2018. The BSc (Hons) Professional Aviation Pilot Practice programme, the first of its kind available in Scotland, greatly increases and accelerates students’ chances of gaining employment as airline pilots in what is a highly competitive industry. The degree aims to enhance students’ career progression within the industry and hopefully attract more females into the career who currently represent less than 10% of the UK’s commercial pilot cohort. There are currently eight female students on the degree course. By embarking on the degree, students can also access funding to help with the often prohibitive costs of becoming a pilot. This will reduce the cost of the training by one third and will include a Flying Instructor Rating. The three-year programme with Tayside Aviation includes structured hours building as well as the CPL, ME IR and MCC training. The partnership also involves partner airline Loganair who operate SAAB 340s, SAAB 2000s, Dornier 328s and the Twin Otter. Tayside Aviation has continued to supply Loganair with experienced pilots on their pilot placement programme over the past five years as hands-on experience is essential for their activity. Students embarking on the degree not only require academic criteria similar to most degree courses but also a Private Pilot Licence (PPL), proving their aptitude, ability and work ethic from the outset. Tayside Aviation holds monthly open days to provide information and course overviews. Please visit www.taysideaviation.co.uk for more information, or telephone (01382) 644372.